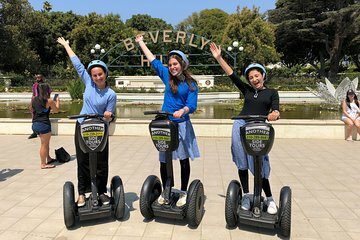 Deslízate por el vecindario más glamoroso de Los Ángeles en una excursión en Segway de 2 horas por los lugares emblemáticos y las calles exclusivas de Beverly Hills. Conozca la historia de este enclave repleto de estrellas mientras sigue a su guía a las famosas casas de Wilshire Boulevard y Benedict Canyon Drive, luego disfrute de las vistas del elegante hotel Hilton y Beverly Hills. Consiga una autofoto al lado del famoso letrero de la ciudad, navegue por las exhibiciones de diseñadores que bordean Rodeo Drive y finalice su recorrido en el corazón del centro '90210'. My son and I took this tour while we were in LA. My son is 13 years old. I would definitely recommend this tour to anyone wanting to see Beverly Hills and Rodeo Drive. Josh was very knowledgeable and the Segway's are easy to use. It was one of our favorite things that we did on our trip to LA. Worth the money!!!!!! Excellente expérience avec un guide parfait. Toute la famille a beaucoup apprécié. Joss was a very good guide ,the tour was first class,took us touring the streets of Beverly Hills showing us all the expensive houses and took us down rodeo drive past all the designer shops.I was travelling with my son who liked all the expensive cars so joss took us to Ferrari and Lamborghini show rooms and even said you can go inside and take pictures as he knew the staff.could not recommend this another plus free cold water on arrival..was impressed that the tour went ahead just with the 2 of us as other tours we have done if company's do not get minimum numbers they cancel.Check this out you will have a lot of fun.